DMV Hearings (Implied Consent Hearings) are the optional hearings for drivers accused of DUI in Oregon who wish to challenge their Implied Consent suspension. If you have been arrested or cited for DUI in Oregon due to a breath test failure (for most people, a reading of .08 or above), you only have ten days from the date of your arrest to request a DMV Implied Consent hearing. This hearing is necessary to challenge an automatic suspension to your license that will be imposed. For most drivers, the suspension will be 90 days and the first 30 days are an absolute suspension (i.e. no driving for any reason). Most drivers with an Oregon driver’s license will be eligible for a hardship permit during the last 60 days of the administrative suspension which will allow for travel to and from work and to and from drug/alcohol treatment. 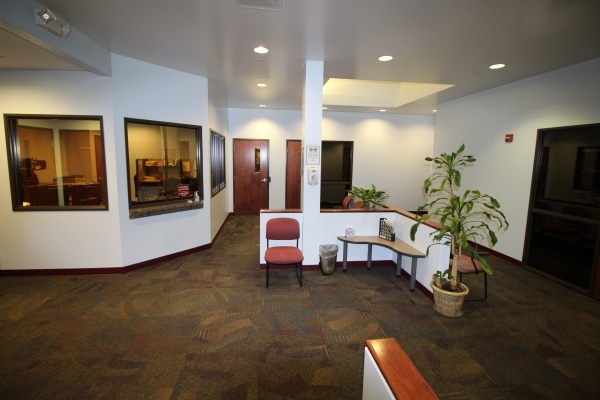 Lobby of the Office of Administrative Hearings Salem Oregon Office. DMV hearings are not required, but are usually a good idea. Don’t let the marketing hype on the Internet fool you: DMV hearings are notoriously difficult to win. Simply requesting a hearing does not ensure that you will be able to avoid an Oregon administrative suspension. However, if you do not request a hearing, you know with certainty that you will lose your driving privileges. By having a hearing, you have a fighting chance at keeping your driving privileges pending the outcome of your DUI criminal case. 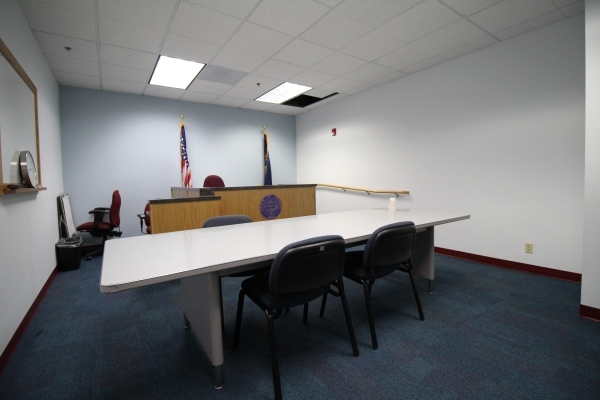 DMV hearings are usually held close to the location at which you were arrested, and are held before an Oregon Administrative Law Judge (ALJ). Hearing room at the Office of Administrative Hearings Salem Oregon Office. The issues to be raised and argued at the hearing vary, but typically include: (1) The reason for the stop. Did law enforcement have reasonable suspicion of DUI or probable cause for a traffic violation? (2) Did law enforcement have probable cause to request Field Sobriety Tests (FSTs)? (3) Was your performance of the FSTs voluntary and were the tests administered correctly? (4) Was the arrest lawful? Were you read your Implied Consent rights? (5) Did you voluntarily agree to perform a breath test (typically into an Intoxilyzer 8000), and was the breath test administered properly and in accordance with Oregon law? 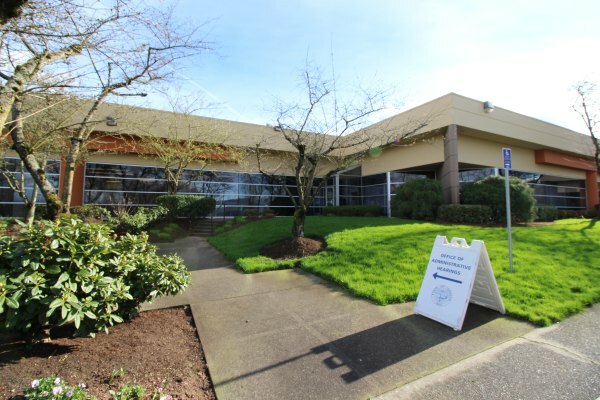 Exterior of the Office of Administrative Hearings Tualatin Oregon Office. DMV Implied Consent Hearings usually take a few hours and are audio recorded by the ALJ. If you prevail (win) at the hearing, the administrative license suspension is not imposed. If you do not prevail, the administrative license suspension will go into effect as it would have had you not requested a hearing. There are no additional penalties (such as increased suspensions or fines) for having a hearing. Hearing room at the Office of Administrative Hearings Tualatin Oregon Office. To have any chance of success at a DMV Implied Consent hearing– other than hoping the arresting officer doesn’t show up– you need to have a knowledgeable & experienced Oregon DUI attorney/lawyer. More often than not, the hearings are won– if at all– on technical grounds. The Oregon DMV has an online form that you can use to request a hearing at no cost. However, if you’ll be working with an attorney, it’s typically best to have the attorney make the request. 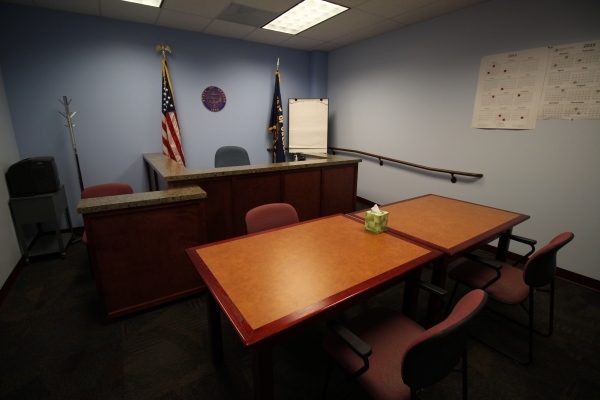 If you request a hearing and it’s scheduled prior to your attorney being able to provide dates of availability (most successful DUI attorneys have busy calendars scheduled weeks or even months out), the Office of Administrative Hearings (OAH) may schedule the hearing for a date and time that your attorney is not available. Nevertheless, if you’re coming up on the end of the 10-day window for requesting a hearing, you can use the form and then quickly tell your attorney to contact the OAH after being retained. If a hearing is requested, DMV hearings are typically within 30 days of the date of your arrest. If the hearing is set out further, the license is typically rescinded (withheld) pending the ultimate outcome of the hearing. This means that if the government can’t hold your hearing within 30 days from the date of your arrest, you can likely keep on driving unless and until there’s a hearing in the future where the suspension is affirmed (put into effect). Neither the Oregon DMV nor the Office of Administrative Hearings charge a fee for DMV hearings. This is true even if you lose. Some attorneys charge hourly rates for DMV hearings, while other attorneys charge flat fees. It is common for attorneys to discuss with their clients just how much effort they want to put into the hearing. Some clients merely want a challenge to what’s called the “prima facie” case. Other clients– with their jobs, employment, or lives on the line– want a much more aggressive and comprehensive challenge. The more effort put into a DMV hearing, typically the more expensive it is. For more information– and to hear our success stories following contested DMV hearings– please call our offices to schedule a no-cost, no-obligation initial consultation.